Last August, John Carmack announced that his small space venture, Armadillo Aerospace, was in “hibernation mode” because of a lack of funding. 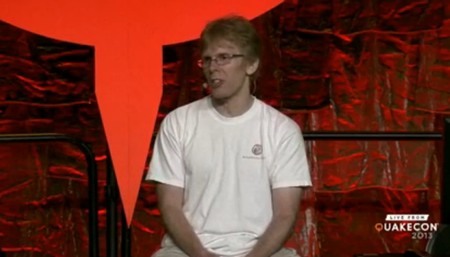 Carmack, discussing the status of Armadillo during a question-and-answer session during the QuakeCon conference in Dallas, said he was actively looking for outside investors willing to fund operations. “If we don’t wind up landing an investor, it’ll probably stay in hibernation until there’s another liquidity event where I’m comfortable throwing another million dollars a year into things,” he said at the time. There’s been no news about Carmack finding an outside investor for Armadillo, but there may have been a “liquidity event” for Carmack. Days after his QuakeCon appearance, Carmack announced he had joined Oculus VR, a startup company pursuing virtual reality technology with a headset called Oculus Rift, as the company’s chief technology officer. Yesterday, Facebook announced it was acquiring Oculus VR in a cash-and-stock deal valued at about $2 billion. That is a pretty big liquidity event. For the record, I am coding right now, just like I was last week.I expect the FB deal will avoid several embarrassing scaling crisis for VR. I can't follow the volume of tweets today, so if you want a real answer to something, try in a couple days after things die down. The FB deal probably will get me to take another swing at aerospace, but not for several years.I have divided my focus too much in the past. @KhanCake It gives me more money (but probably not nearly as much as people are thinking) to "squander" on it.